A girl begins to dream. Finding herself in a room much like her own, she discovers a nexus of doors leading to many different places. Some of these dreamscapes are pleasant, while others quickly turn into nightmares. Collecting objects known as "Effects" to get to new places, she continues to wander aimlessly through the dream world. When each dream ends, she writes the events in a diary, and soon drifts off to sleep once more. As she tries to understand the meaning behind these dreams, this girl soon discovers that she may not be alone, as someone is watching her and her dreams closely. Yume Nikki: Anata no Yume ni Watashi wa Inai was published digitally in English as Yume Nikki: I Am Not in Your Dream by J-Novel Club on January 7, 2018. First of all, this novel is based on a unique RPGMaker game Yume Nikki, which translates as "Dream Diary", but by no means it can count as an actual adaptation. The game itself is about exploring the weird, quiet and surreal dreams of a girl you play as, and doesn't have any written story or explanation of what's going on. People try to come up with countless theories of the meaning of the story themselves. And basically this novel is one of the countless possible explanations of the game's story that the writer came up with. The original creator never confirmed the novel (or the manga) as the "correct" way to interpret the story (or if they were even involved with the creation of the novel and the manga). So if you want to read this because you're curious what Yume Nikki is, better go play the game, because it's an experience that cannot be conveyed by words. The novel isn't a retelling of the original plot either, and it actually expects you to know the game. But it can be quite enjoyable as a single interpretation of what Yume Nikki could be about. The eerie atmosphere of mysteriousness and hopelessness conveys very well. The descriptions of the dream worlds were pretty well done, although there could have been more of them, at some points the writer begins to just list what more dream worlds and "effects" there are besides the ones already described. Then he states that they all were visited and then contradicts himself portraying the characters being surprised when visiting for the first time the places they supposedly already know. The story is told from the perspective of a single character. The narrator's personality and mental state were very convincing and well-written. Even if confusing at first, in the end everything makes sense, and we get to see very believable and touching character development and a satisfying conclusion. The secondary characters turned out to be pretty impactful, even the ones who appeared only briefly. The book keeps the reader in suspense until the very end while the story was slowly unveiled itself, and you keep guessing what's going on until the very last pages. It's noticeable that the writer put a lot of thought in his theory, so he explained quite a lot of things from the game, and made his explanation sound logical and unique. But of course he left a lot of mysteries unexplained and was sometimes inaccurate, and he changed quite a bit of things so they conveniently fit his story, plus he comletely ignored and didn't mention anything that didn't fit in his view of the plot. Changing those things isn't necessarily bad, because it's the only way to make a Yume Nikki novel that makes sense, and the writer succeeded in doing just that. So in the end I think it's a wonderful novel. The illustrations in this novel are very nicely done, you can even say they're the best part of the book for a Yume Nikki fan, and there's a lot of them. The artist did a very good job portraying how the characters are supposed to look like in a realistic style, so all the art and character designs ended up being beautiful. Enjoyment of this novel depends on if you know the original Yume Nikki. If you don't, you'll just end up just confused and bored for the most part, because you'll notice only boring explanations about psychology and drama between characters you don't know in a gloomy setting. 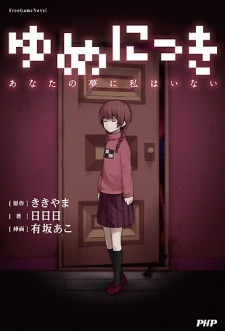 If you read it expecting an interpretation, it can be an interesting fresh approach on the original story for you, especially since the writer researched psychology a lot to find something in common with Yume Nikki, so a lot of his ideas make sense, plus it shows an unexpected resolution if you read it until the end. Myself, as a fan of the game, have found this novel very curious. So I would definitely recommend this to any Yume Nikki fan! And if you never experienced Yume Nikki before, I will repeat myself and say - just go play the game if you like the theme of dreams, and the psychological/dementia/mystery/surreal genres. It's a work of art, and it's free in any case so you won't lose anything if you give it a try.